The first priority of Muhammad, may Allah bless him and his Ahlul-Bait, upon arrival in Yathrib, was to build a mosque for praying to Allah. There was a vacant plot in front of Abu Ayyub's house, which belonged to two orphans. The Apostle met them and their guardians, and offered to buy that land. They replied that they would be very pleased to gift the land to him. The Apostle did not want to take anyone's obligation, so he declined to accept it as a gift and they eventually agreed to accept payment for their land. The mosque of Yathrib was very simple, the walls were made up of unbaked bricks and mortar, and the roof was supported by trunks of palm trees and covered by date fronds. The floor of the mosque had no covering. Two huts were built on the outer wall, one each for Sauda, the daughter of Zama'a; and Ayesha, the daughter of Abu Bakr, the two wives of the Prophet Muhammad at the time. Among the Companions of Muhammad, was Ammar ibn Yasir, who was the first man in Islam to build a mosque. He had built a mosque in Mecca itself and he prayed in it, long before he migrated to Yathrib. When the mosque was being built, an incident took place. Ammar ibn Yasir came in when they had overloaded him with bricks, saying, "They are killing me. They load me with burdens they cannot carry themselves." Umm Salama, the Prophet’s wife said: "I saw the Apostle run his hand through his (Ammar’s) hair – for he was a curly-haired man – and say, "Alas, Ibn Sumayya! It is not they who will kill you, but a wicked band of men." This prophecy is said to have been fulfilled when Ammar was killed at Siffin. Ali composed the following verse: "There’s one that labors night and day;To build us mosques of brick and clay;And one who turns from dust away." Ammar learned it and began to repeat it. One of the Prophet's companions, Uthman b. Affan thought that it was he who was referred to in it, He said: "I have heard what you have been saying for a long time, O Ibn Sumayya, and by Allah I think, I will hit you on the nose!" Now he had a stick in his hand, and the Apostle was very angry and said: "What is wrong between them and Ammar? He invites them to Paradise while they invite him to hell. Ammar is as dear to me as my own face. If a man behaves like this he will not be forgiven, so avoid him." Muhammad , the Messenger of Allah, was seen removing dust, with his own hands, from the head and the face of Ammar ibn Yasar. No other companion of Muhammad received such honour. Uthman b. Affan, one of the future khalifas of the Muslims. was hesitant about working in dust and mud, and getting his clothes soiled. Many years later when he became khalifa, and found power in his hand, he ordered his slaves to knock down Ammar ibn Yasir and to beat him up – the man who was as dear to Muhammad , the Apostle of Allah, as his own face. Ammar ibn Yasir already enjoyed four distinctions which made him the envy of all the other companions of Muhammad, the Messenger of Allah. ● He belonged to the First Muslim Family. ● He was the son of the First and the Second Martyrs of Islam. His mother, Sumayya, was the first, and his father, Yasir, was the second martyr in Islam. ● He was the builder of the first mosque. ● He was the beloved of Muhammad, the Apostle of Allah. Muslims offer namaaz five times a day but initially there was no way to call the faithful to prayer. A companion suggested to the Prophet that a trumpet or bell should be used to alert Muslims before the time of each prayer. He did not accept this suggestion, as he said that he did not want to adopt the Jewish or Christian customs. Then, according to Sunni scholars, Abdullah bin Ziyad, a citizen of Yathrib, said to Prophet that while he was half-asleep, a man appeared before him and told him that the human voice ought to be used to call the faithful to prayer; and he also taught him the Adhan- thecall to prayer. The idea appealed to the Prophet, and he then called Bilal, taught him how to call the Muslims to prayer, and appointed him the first Muezzin of Islam. Shia Muslims don't accept this view. They say that just as the Holy Qur’an was revealed to Muhammad, so was Adhan and it could not be left to the dreams of some Arab. If the Apostle could teach Muslims how to offer each prayer, he could also teach them how and when to call others for each prayer. Soon the name "Yathrib" became obsolete. People began to call it "Medina-tun-Nabi," – the City of the Prophet. In due course, usage caused a contraction of this name and till today it is known as "Medina" – "the City." The basic population of Medina consisted of its three Jewish tribes, the Quainuqa, the Quraiza and the Nadhir; and of the two Arab tribes, the Aus and the Khazraj. The Jews were farmers, merchants, traders, money-lenders, landlords and industrialists.The two Arab tribes of Medina, Aus and Khazraj, made their living by farming. Before the arrival of the Prophet, they had been locked up in a war against each other which had left them utterly exhausted. There were a few Christians also living in Medina. Little later, a fourth group in Medina came up. They were "hypocrites" who outwardly professed Islam but they were not sincere. ● All disputes between any two parties in Medina would be referred to Muhammad for his decision on them. ● Muslims and Jews would enjoy the same rights. ● Each group in Medina would follow its own faith, and no one group would meddle in the affairs of any other groups. ● In the event of an external attack upon Medina, both groups, i.e., the Muslims and the Jews, would defend the city. ● Both groups would refrain from bloodshedding in the city. ● Muslims would not go to war against other Muslims for the sake of non-Muslims. The charter established that Jews and Moslems were to aid each other in all matters concerning the city. They were to be allies against all common enemies, and this without any mutual obligations toward Islam or Judaism. The main clause of this charter ran as follows: The Jews who attach themselves to our commonwealth shall have an equal right with our own people to our assistance and good offices. The Jews of the various branches domiciled in Medina shall form with the Moslems one composite nation. They shall practice their religion as freely as the Moslems. The clients and allies of the Jews shall enjoy the same security and freedom. Muhammad called the refugees from Mecca "Muhajireen" (Emigrants); and he called the citizens of Medina who had welcomed them, "Ansar" (Supporters). The Muhajireen were even more downtrodden. They had abandoned everything they had possessed in escaping from Mecca. It had originally been arranged that the Refugees should assist the Ansar in their field-work; but knowing nothing of palmiculture, they could only perform the most menial services like collecting wood and drawing water; and Ali, at least on one occasion, earned sixteen dates by filling buckets with water, and emptying them over mould for brick-making at the rate of a date a bucket; which hardly earned a meal he shared with the Prophet. To rehabilitate the homeless Muhajireen in Medina, and to integrate them into the economic and social life of the city, Muhammd made them "brothers" of the Ansar. This way he reorganized Muslim ranks so as to consolidate their unity and to wipe out every possibility of a resurgence of division and hostility. In the realization of this objective, he asked the Muslims to fraternize with one another for the sake of Allah and to bind themselves in pairs. Ammar ibn Yasir and Hudhayfa al-Yamani, Abu Bakr Siddique and Kharja bin Zayd, Umar bin al-Khattab and Utban bin Malik, Uthman bin Affan and Aus bin Thabit, Abu Dharr al-Ghiffari and Al-Mundhir bin Amr, Mas'ab ibn Umayr and Abu Ayyub, Abu Obaidah Aamer al-Jarrah and Saad ibn Maadh, Zubayr ibn al-Awwam and Salama bin Waqsh, Abdur Rahman bin Auf and Saad ibn Rabi, Talha bin Obaidullah and Ka'ab ibn Malik. 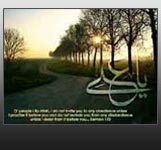 Ali ibn Abi Talib alone was left without a "brother." Then, the Apostle of Allah held him by his arms and said to him: "You are my brother in this world and in the next." But Ali, like himself, was a Muhajir (Emigrant), and yet he (Muhammad) chose him (Ali) to be his brother. In doing so, he was accenting the extraordinary position and special status of Ali in Islam. This was not, however, the first time that Muhammad had declared Ali to be his brother. Earlier, in Mecca, he had made his companions the "brothers" of each other. The pairs of "brothers" in Mecca were made up by Abu Bakr and Umar; Uthman bin Affan and Abdur Rahman bin Auf; Talha and Zubayr; Hamza and Zayd bin Haritha; and Mohammed ibn Abdullah and Ali ibn Abi Talib.